Why Choose INNsight? We are the most trusted Digital Marketing company. Hundreds of Hospitality Businesses choose INNsight to design their website and drive their Internet marketing. Why Choose INNsight to Manage Your Digital Marketing? INNsight builds the most cutting-edge technologies for hospitality businesses. As a software company based in San Francisco, the high-tech capital of The World, we are driven to innovate. We are focused on developing software solutions to help hospitality business owners to drive more bookings, online orders, appointments and sales. Entrusting a web designer for your hotel, restaurant, or salon’s website is a big disservice. Website design is commoditized. You can get yourself a template website, but digital marketing is more than a set it and forget it exercise. Don’t pay an exorbitant cost to set up your website only to see it be outdated as quickly as technology changes. As a high-technology company, INNsight not only does website design but offers a whole lot more to our hospitality clients. INNsight will custom design your website for free and will continuously update it. Our Content Management System will enable you to update photos and media with ease. Our Social Media Management will manage your social feeds and help drive more direct traffic along with our Search Engine Optimization and Pay-Per-Click Marketing efforts. INNsight also provides a suite of tools and services to assist you in managing your hotel’s operations from our full-fledged Property Management System to our Reputation and Facilities Management Systems. 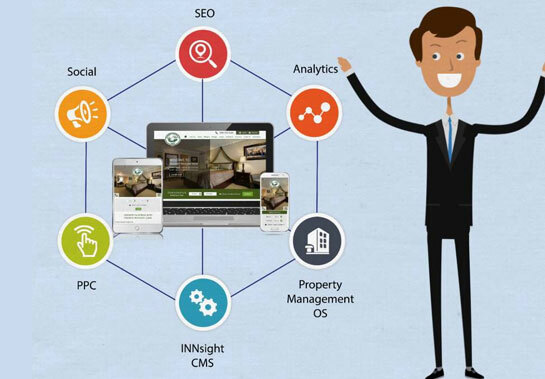 INNsight is The Hotel Industry’s only true end-to-end solution for the marketing and management of your hotel. Restaurants and Bars, Salons and Spas, Golf Courses, and Wineries get to take advantage of customized scheduling and menu management tools and impressive website design that drives more online orders and appointment bookings, resulting in more sales. We have been in the game for over 10 years and have built technology that has driven millions of dollars of direct revenue for our hotel customers. INNsight has booked hundreds of thousands of hotel rooms for its clients and is an expert in hotel marketing and reservation management. We have hundreds of hotels, from marquee hotels in Downtown San Francisco, to independent hotels in Myrtle Beach who have chosen to work with INNsight. We are trusted by Choice, Wyndham, Vantage, Red Roof Inn, and IHG hotel owners to market their hotels. Our technology supports language translation and currency conversion, and we have international clients who look to INNsight to market their hotels to The World. We simplify digital marketing and solve your hotel’s business problems. No wonder, we maintain a retention rate of over 95% with our valued customers. No Up-Front Fees Don't pay a penny for your custom designed hotel website. INNsight’s web design is completely FREE! Cancel at Any Time We hang our hat on our product and services. We don’t tie you to unfair long-term contracts. If we do not perform, you can cancel. Affordable Subscription Fees The ROI is huge! Low monthly subscriptions start at just $129 per month! Most customers see at least $10k in direct room revenue per month through their hotel website Powered by INNsight. Sign up today and get your hotel Powered by INNsight !